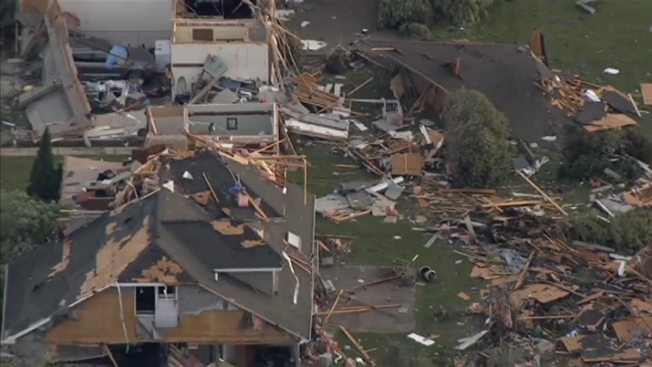 National Weather Service forecasters late Tuesday said a total of nine tornadoes passed over Northern Illinois during Monday night's storms, including an EF-3 twister that was the strongest the Chicago metropolitan area had seen in nearly 25 years. The most powerful tornado was a long-track twister that traveled for more than 16 miles before intensifying to the strong EF-3 tornado that hit Coal City. That tornado was the strongest to hit the area since the deadly Plainfield tornado of Aug. 28, 1990. Monday's EF-3 started in Morris and traveled southeast through Coal City and over Interstate 55 before ending in Braidwood. An official said the damage left behind was "eerily close" to the damage the area saw during tornadoes in 2013. The storm passed near the Braidwood Nuclear Generating Station, but Matt Friedlein, the lead forecaster for the National Weather Service in Romeoville, said he didn't know if there was any damage to the plant. An EF-3 tornado carries winds between 136 and 165 mph. How's the Fujita Scale Work? An EF-2 tornado rolled over Woodhaven Lakes, in Sublette, in Lee County, and just east of Interstate 55, along the Grundy-Will County line. An EF-2 tornado indicates wind speeds between 111 to 135 mph. At least five people were injured in Sublette, which officials said was "decimated" by the storms. Gov. Bruce Rauner deployed a search and rescue team to the campground in Lee County and issued a state disaster proclamation for Lee and Grundy counties. Two tornadoes the National Weather Service classified as EF-1s hit near Mendota. Other EF-1s passed near Harmon, Ottawa, Coal City, and Kankakee. An EF-1 tornado has winds between 86 to 110 mph. A weak EF-0 tornado with winds between 65 and 85 mph touched down briefly south of Herscher but did no damage.